Ms. Quinn welcomed the opportunity to make a difference in the lives of more children and their families. Heather Quinn had a tough choice: whether or not to leave her longtime job as director of the Chilmark Preschool for an Islandwide position heading Early Childhood Programs, an agency of Martha’s Vineyard Community Services. What swayed Ms. Quinn, she said, was the opportunity to make a difference in the lives of more children and their families. This summer, she made the move and succeeded Debbie Milne, who was trained by Early Childhood Programs founder Helen Maley and headed the agency for 35 years before retiring in July. Ms. Quinn has filled big shoes before. 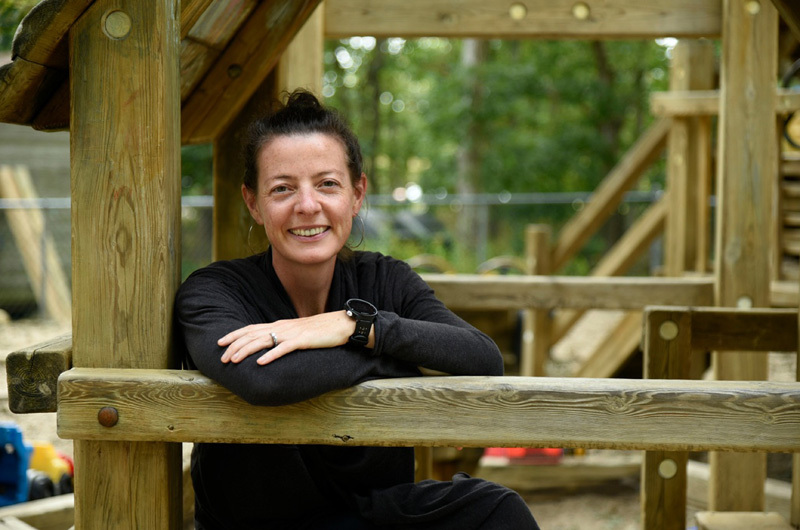 At Chilmark Preschool, she took over from founding director Chris Abrams, who like Ms. Quinn holds a master’s degree in education from Wheelock College in Boston. Before her graduate work in birth-to-three education, which she described as “a combination of infant and toddler behavior and development and family support,” Ms. Quinn earned her undergraduate degree in early childhood education from the University of Massachusetts at Amherst. Along the way, she followed a parallel career waiting tables at area restaurants. “When I realized how much my master’s degree was going to cost me and how much I was going to be making in my chosen career, I thought it would be a wise idea to learn to be a pretty good waitress,” she said. Her wise idea turned life-changing when Ms. Quinn began working with a Boston chef named Robert Lionette, who now heads the culinary program at Morning Glory Farm. “That’s how we crossed paths,” she said of the man who became her husband and introduced her to Martha’s Vineyard. The two were living in Boston’s South End with their son Jack, who was almost four, when Mr. Lionette accepted the job of head chef at a Vineyard Haven restaurant nine years ago. Ms. Quinn moved here “almost sight unseen,” she recalled. “It was a significant leap of faith for me,” she said. But she didn’t plunge in without a plan. “I wanted to get my feet underneath me before exploring professional opportunities,” Ms. Quinn said. Calling on her second career, she took a waitressing job at the Artcliff Diner that lasted long after she took the director position at the Chilmark Preschool eight years ago. At Community Services, Ms. Quinn heads a staff of about 20 who serve more than 1,000 families a year through three different programs: home-based Head Start for ages three to five, an on-campus child care center serving infants, toddlers and preschoolers and an offsite family center in Vineyard Haven. “The mission for all three of our programs is to strengthen families,” she said. Unlike most conventional Head Start programs on the mainland which require families to come to a Head Start center, the Vineyard program brings services to their homes. “Every enrolled family has a home visitor who comes for an hour and a half a week,” Ms. Quinn said of the federally-funded program, which is designed to make sure young children from low-income families are ready for school. Head Start also hosts a weekly parent group, and twice a month, family outings called socializations at places like the Farm Institute, where children and parents can bond through shared experiences. Head Start children are screened for development, health, vision and nutrition, with families connected with services as they need them. “We’re currently recruiting families for Head Start,” Ms. Quinn. The Vineyard program now serves 42 families with six home visitors, one of whom speaks Portuguese. Another Portuguese speaker is available as a translator, Ms. Quinn said. Eligibility for Head Start is based on the federal poverty guidelines, which are established nationally with separate guidelines for Alaska and Hawaii. Ms. Quinn believes Martha’s Vineyard needs different federal poverty guidelines as well. “I think you could argue that we should have our own,” she said, given the sharply higher cost of living on the Island. The current system “puts us at a disadvantage when it comes to servicing families,” she added. 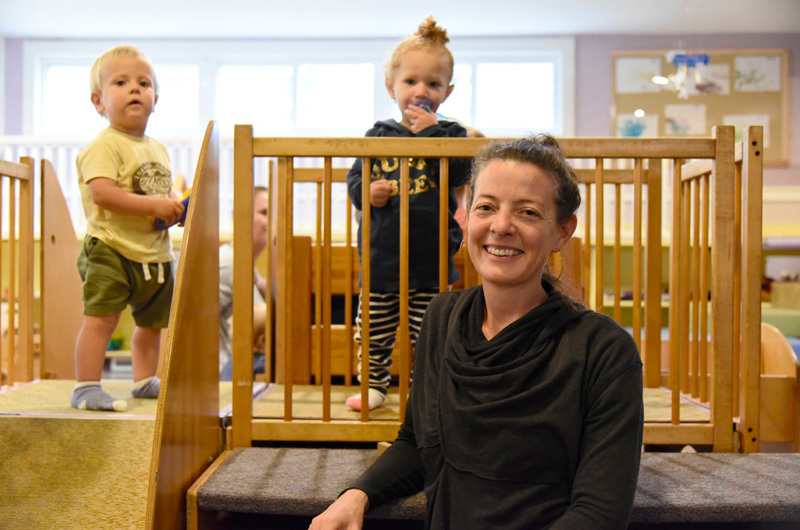 The on-campus child care center is the only center on Martha’s Vineyard with income-eligible spots as well as spots for children whose welfare is supervised by the state Department of Children and Families, Ms. Quinn said. In fiscal year 2016, she said the center’s nine teachers and one program coordinator served 91 families. More than 800 families used the Family Center last year, Ms. Quinn said. Located on Greenwood avenue across from the library in Vineyard Haven, the center offers play dates, parent groups, referrals and a panorama of other free family services. Ms. Quinn herself continues to facilitate a parent group on top of her duties as director, which include not only the day-to-day operations of Early Childhood Programs, but planning for the future as well. Congratulations, Heather! Sounds like the program is in great hands! Building a strong community through important programs. A main reason the island is so special. I bet you will be fabulous. I miss you and breakfast at the Artcliff! The rules were simple. The highest bidder acknowledged by the auctioneer shall be the purchaser.